Manix™ 2 Carbon Fiber CPM - Spyderco, Inc. Page 1060 – Spyderco, Inc. This limited edition Sprint Run of our best-selling Manix™ 2 features an extraordinary CPM® S90V®/CPM 154 composite steel blade. This remarkable steel was created by Crucible Industries of New York and is the result of an extremely advanced manufacturing process in which a plate of precision-ground CPM S90V steel is encapsulated in CPM 154 powder. The canister containing these steels is then sealed in a vacuum and subjected to extreme heat and pressure to forge weld the CPM 154 to the CPM S90V, creating a three-layer composite steel slab. This extraordinary manufacturing method uses specialized equipment and welding techniques primarily reserved for the manufacture of high-performance aircraft engine parts that are held to extremely rigorous quality standards. In a finished knife blade, the lines where the steel layers meet are clearly visible, adding greatly to the knife's aesthetics. To further showcase this unique blade material, this limited edition Manix 2 features textured peel-ply carbon fiber handle scales. 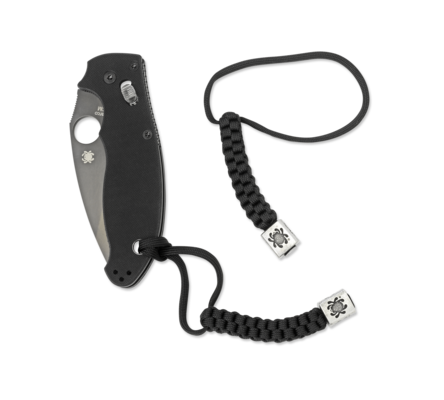 This premium material complements the proven features of the Manix 2—including its high-strength Ball Bearing Lock™ mechanism, Trademark Round Hole™ for one-handed opening, and ambidextrous tip-up pocket clip—to create a truly exceptional expression of this design. Manufactured at Spyderco's Golden, Colorado factory, this rare Sprint Run of the Manix 2 is sure to become a coveted collector's item.